The partner program provides guides, tools, support and electronic licenses of 1C:Enterprise for 1C partners around the world and aimed at helping partners to develop and sell business applications, services and projects – all developed on 1C:Enterprise. Today, 1C Company announced a new international partner program for 1C:Enterprise, a robust and widely used business applications platform used by over 1 million companies. 1C:Enterprise is a suitable and comprehensive development platform to create cloud or on-premise business applications in a rapid-develop environment. 1С Company was established in 1991, and since the beginning has held true to its strategy of working only with partners. The new partner program is the best option for partners to gain access to the latest versions of 1C:Enterprise, to develop their own state-of-art business applications in a fast and efficient way, and to create the most innovative offerings in the international marketplace. The new partner program consists of several levels. 1C:Official Partner introductory status is for partners who have not developed their own products on the 1C:Enterprise platform, and need to acquire 1C:Enterprise licenses to implement projects for their clients. 1C:Solution partner status is intended for partners who have developed a solution and certified it with 1С. 1C:ASP partner (Application Service Provider) is for partners whose business plan is providing services based on the 1C:Enterprise platform. 1C:Regional partner status is intended for partners who have their own certified products and sell through their own regional partner network. 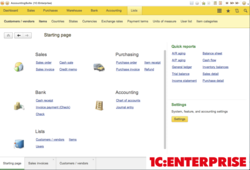 1C:Enterprise is now available in a new license delivery model – all types of licenses for 1C:Enterprise can be ordered, paid, and immediately received on the web site by partners or end-users. All partners can acquire any number of products through the online store at a discount according to their partner level. We invite you to partner with us, today! Partners interested in learning more or signing up to develop applications on 1C:Enterprise platform can visit Become a partner page.